For most people, some kind of work is necessary in order to eat and have a place to live. In rural areas, the main work of many families involves farming, fishing, hunting and gathering, or other forms of food production. Equally important is the work of 'keeping house' and bringing up the family. Who does most of the work within a family depends on local customs and the family's situation. In most poor rural families nearly everyone-women, men, and children -help with the work of survival. By the time they are 5 or 6 years old, children may be helping to take care of the babies, feed the chickens, herd the goats, shell and clean the grain, and to carry out other tasks so that the older members of the family are free to do other work. In many societies, children by age 8 or 10 bring in more income (food or money) than it costs their families to take care of them. Work-whether it is done by adults or children-can be either a good or bad experience. It can help persons gain dignity and independence. Or it can take away their dignity, freedom, and health, How workers are affected depends on work conditions, on the fairness of wages, on workers' rights, and on how much respect and equality exists between workers and bosses. In some situations, especially in cities, many children are forced to work long, hard hours in unsafe or unhealthy work conditions for very low pay. 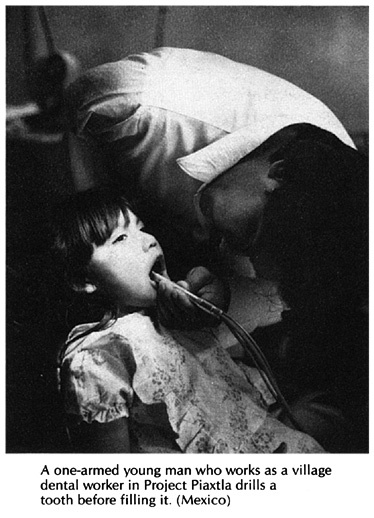 Such 'child labor' is cruel, and may result in permanent damage to the child's body or spirit. In some rural areas, children from the poorest families must also work long, hard hours under difficult conditions. But for many rural children, the opportunity to help their families with the labor of production and survival is a greater adventure than is 'play'. The chance to take care of a real baby (not just a doll) or to help grow the family food, gives many farm children a feeling of importance, self-confidence, and personal worth that is not often seen in city children. As a child grows up, to be wanted and well cared for is not enough. A young person needs to feel that he or she is needed. To become 'independent' can be important. But just as important is to develop an ability to do things for and with others, to contribute toward meeting the needs of family, friends, and community. Too often disabled children are not given the opportunity to become helpful or needed, or to learn the skills to contribute in an important way to the family or community. The family and community need to look ahead to the disabled child's future. They need to find ways to build on whatever strengths she has, so that she can have a full and meaningful role in the community. In some cultures, especially in Europe and the United States, great importance is placed on work to earn money. Often it seems that a person's worth is measured by how much money he or she makes. 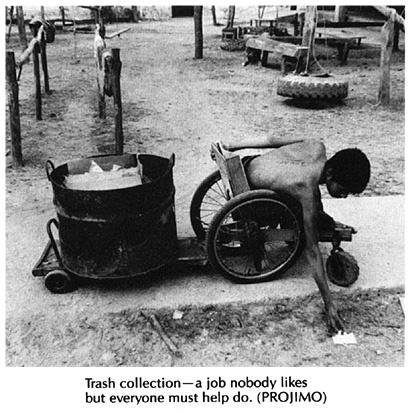 Where such a value system exists, a standard goal of rehabilitation is to prepare disabled persons to work at some kind of money-earning job. But caution! This goal of a paid job may not be appropriate in some parts of the world. Traditions and local values differ from place to place. Some societies are more accepting of persons who do not earn or 'produce', as long as they contribute and take part in other ways. Also, we must remember that in poor countries the unemployment rate (people without work) is often very high, even for the non-disabled. It may be very difficult for a disabled person to get a job, even if well-trained. There are many ways, other than by working for money, that disabled persons can contribute to their family and community. They may be able to learn skills to help with daily activities in the home. Or they may become leaders for community action. 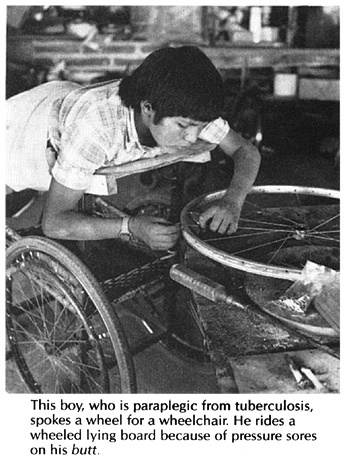 As we discussed in Chapter 45, disabled villagers who are unable to do hard physical farm work, often make outstanding health workers (paid or volunteer), rehabilitation workers, popular organizers, or defenders of human rights. It is important that rehabilitation programs have a broad view of how disabled persons might work or fit into the community. Too often 'skills training' prepares a physically disabled person to do jobs that able-bodied persons could do just as well. The challenge, whenever possible, should be to build on the unique strengths, experience, and qualities of the disabled person: help her to find a role in society that she can do better than most non-disabled persons. Disability does make a person different in certain ways, for better and for worse. Rather than pretending that the difference does not exist, it is wiser to accept the differences and look for ways that being disabled helps to deepen or strengthen the person. Help the person to have not just an ordinary role in society, but one that is in some ways outstanding. Persons like Helen Keller (a blind and deaf woman who became a social leader and agent for change) can be our role models. Rehabilitation programs and families should avoid planning a child's (or adult's) life work, or role in the community, for him. Rather, we should help make available as wide a range of opportunities as possible. Our goal should always be to open doors for the child, not to close them. He will probably make a better farm worker than a writer or bookkeeper. ...than trying to learn physical skills that will always be more difficult for her. She may make a better health worker or school teacher than a farmer or grain grinder. ...than trying to learn skills that require use of his legs and feet. He may make a better sandal maker or welder than a field worker. ...than trying to learn jobs that are much more difficult without eyesight. He will probably make a better village musician than a goat herder or hunter. CAUTION: It usually makes sense to help a child develop specialized work skills in the areas where she is strongest. But it is also important for her to develop self-care and daily living skills as best she can, even though this may be difficult. Thus the child who is mentally retarded needs to learn basic communication skills. The girl with spasticity needs to learn, if possible, how to prepare food and keep house. The weak-legged boy or blind child needs to learn how to get from place to place. Learning skills that require more mental than physical activity can help the physically disabled child to gain a place in the community. 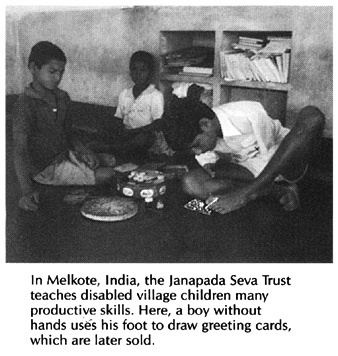 For development of skills such as reading, writing, and arithmetic, when possible, it is usually best that the disabled child go to school. Ideas for helping the child get to school and be accepted there are discussed in chapters 47 and 53. If the child cannot go to school, figure out ways for her to be taught at home - perhaps by school- children. As soon as the child learns to read and write, try to buy or borrow simple, interesting, and educational books. With these the child can develop her mind further. Starting a village library is often an excellent idea. In fact, a disabled young person may be able to become the village 'librarian'- and a non-formal educator. To open up other possibilities, help your village recognize both the needs and value of disabled and other disadvantaged persons (such as single mothers). When deciding who to choose for public service jobs and community responsibilities, try to make it a village policy to consider choosing persons who have disabilities or special needs. Although they are sometimes unable to do hard physical farm work, disabled persons can often make outstanding health workers, cooperative administrators, shop keepers, librarians, 'cultural promotors', or child care center coordinators-if they are given the chance. Persons with weakness in their lower bodies but who have strong arms and hands can learn a wide variety of work skills where they can sit and use their hands. (See list of skills on Page 509.) However, for many villagers, the growing of food is central to their lives. 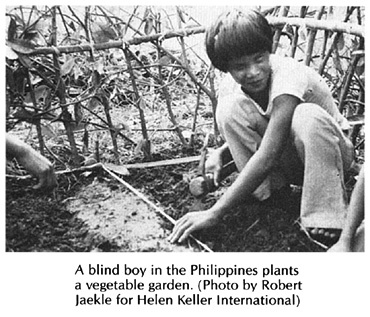 If certain adaptations are made, disabled villagers can often help with farming and gardening. Here are a few suggestions. Getting to distant fields over rough trails may be difficult for the young person who cannot walk. A simple carrying frame can be used to carry the child and also the tools and grain. For the child who is blind, or has difficulty with balance, hand rails may make it easier to get from the house to the garden, the latrine, and the well or water hole. Many disabled villagers will need to learn skills other than farm work. If unemployment is high it may not be wise to train disabled persons for jobs where there is a lot of competition. In fact, any sort of paid job may be hard to get. Therefore, it often makes more sense to teach young disabled persons skills so that they can become self-employed. Or perhaps several disabled and non-disabled persons can become partners in a small 'home industry'. A village-based rehabilitation center with a shop can teach young disabled persons different manual skills such as leatherwork, clothes making, woodworking or welding. While they are with the program, they can use these skills to make a wide range of rehabilitation and orthopedic equipment. They can also make toys, chairs, leather goods, clothes, and other objects for sale. The income from the sale of these things can help cover some of the costs of the rehabilitation program and training. When the learners have gained enough skills, perhaps the community program can help them set up their own small 'shop' in their home, village, or neighborhood. In several countries, organizations for the disabled have started revolving loan plans that provide the disabled craftsperson with the basic equipment to start his or her own small business. The loans are paid back little by little over a reasonable time, so that the same money can be used to help another disabled person get started. In the West Indies, the Caribbean Council for the Blind provides a guarantee to local banks which give 'start-up' loans to disabled persons. So far, 97 percent of the disabled persons who have received loans have met their payments on time. This record is better than that of able-bodied persons. It helps convince bankers not only that disabled persons can run their own small businesses responsibly, but that they are a good investment. By involving local banks in the loan program, the public is being educated toward a new respect and appreciation for disabled persons. 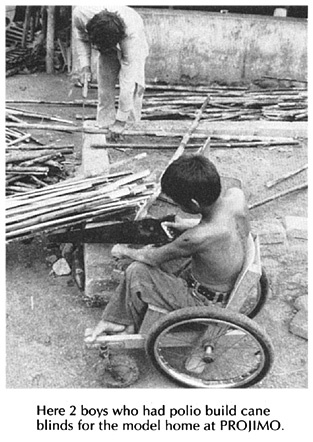 Disabled villagers can become skilled in a wide variety of manual skills. Here we list some skills that are taught in different rehabilitation programs, training programs, and special workshops. The above list includes only a few of the activities that disabled persons have learned in order to run their own small business or set up shop in their home. As much as is possible, let the disabled person decide what skill or skills she wants to learn. Choices that are possible will depend on the person's combination of disability, abilities, and interest as well as on the local situation, resources, market, training opportunities, and other local factors. Leaders in the Community Rehabilitation Development Project (see Page 520) in Peshawar, Pakistan realize that in their country it is very difficult for disabled persons to 'earn a living'. Most either live by begging, are cared for by their families, or die of neglect. Since chances of employment are so limited, it is more realistic to help disabled persons learn simple craft skills for self-employment at home (if they have a home) or in the marketplace. They can make small things at low cost and sell them in the marketplace. If their small business helps the family a little or covers part of their daily expenses, something has been gained. In the marketplace of Pakistan there is a variety of clever, simply made cages, tools, utensils, toys and other objects, mostly made out of very low-cost or waste materials. The Project has hired a self-taught craftsperson to collect, study, and make design plans for some of these marketplace things, so that disabled persons can learn to make and sell them. To follow are a few examples. For more complete instructions, write to Mike Miles, Mental Health Centre, Mission Hospital, Peshawar, N.W.F.P. Pakistan. These examples and the examples on the next page are from FAMN/UNICEF Community Rehabilitation Development Project, Peshawar, Pakistan. A disabled girl can go to the river to learn to wash clothes with other girls and their mothers. A disabled boy can go to the fields to help plant, weed, and harvest alongside his able-bodied brothers, sisters, and father. A disabled child can go to the same school as other children, and then go on to some specialized training course. A disabled young man or woman may enter a shop or production team as an apprentice just as non-disabled young persons often do. For a mildly or moderately disabled child, there are many possibilities to prepare for life's work together with non-disabled children - especially if parents encourage the child and explore opportunities. 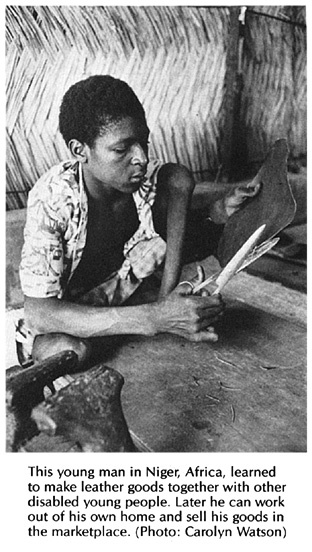 A community rehabilitation program can help by encouraging schoolteachers, schoolchildren, training program instructors, craftspersons, and possible employers to be more open to giving disabled young people an equal chance. For more severely disabled young people, opportunities for integrated education or skills training will be much more limited. Alternatives need to be looked for, or arranged, especially in communities that are still not open to giving them an equal chance. Different approaches have been tried to help disabled persons learn specific skills. In cities, special training centers are sometimes set up for children with similar disabilities. These include programs for deaf children, centers for retarded young persons, and programs for blind children. Each program chooses skills and activities suited to the particular limitations and abilities of the group. 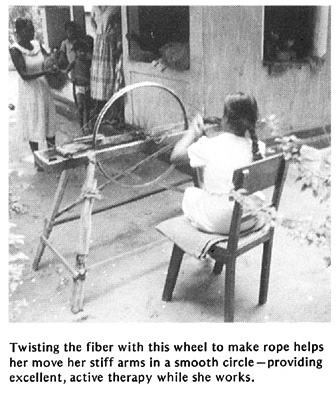 For example, a skills training and production program for the blind may focus on skills that depend largely on touch, such as weaving or chalk making. In smaller villages, it is often not possible to bring together enough persons with the same kind of disability to create a specialized training program just for them. However, a community rehabilitation program can, in its workshop, include a variety of skills training opportunities which can be adapted to persons with a wide range of disabilities. 'Sheltered workshops - yes or no? Sheltered workshops are special training and production centers for disabled persons. The idea is to provide a work opportunity and a little pay to those who would find it difficult to get training and employment 'on the outside'. At best, these workshops can be a very valuable experience for participants, and may serve as a step toward greater independence. They help participants gain the technical and social skills, work habits, responsibility, and self-confidence needed for outside employment or self-employment. At worst, sheltered workshops can (and often do) actually hold back the development and crush the spirit of participants. Too often they are run by persons who treat the workers like babies or slaves, giving them simple, repetitive tasks. The workers are not involved in the planning, organization, or running of the program. They are simply told what to do. They become increasingly dependent on the center and fearful of their inability to make it on their own in the outside world. Perhaps the key difference between these two kinds of sheltered workshops is the question of control and equality. If the participants are involved in the direction and decision making of their own program, then they will grow and mature along with the program. Perhaps they will make more 'mistakes' than a program that is controlled and run by 'superiors'. But they will learn from those mistakes. At the same time they learn crafts, they learn skills in decision-making, problem-solving and small-group democracy - essential skills for improving life in the 'real world'. A community-based rehabilitation program run by disabled persons may have some features of a sheltered workshop. It may provide special training and work opportunities adjusted to the pace, abilities, and limitations of each participant. It may provide such an enjoyable 'home' and 'family' setting that some persons may choose to keep working rather than to 'move on' into the 'outside world'. But because it is a program run by disabled persons, and major decisions are made at all-group meetings, it tends to be a dignifying and liberating experience. A program where disabled and non-disabled persons work side by side, sharing equally in decisions and responsibility, may be even more liberating. Children with paralysis in their bodies often develop strong arms and hands - and can do many kinds of work as well as anyone. Whenever possible, look for work that will help a disabled person fit into the life of his or her community, and that will also provide needed exercise or therapy. 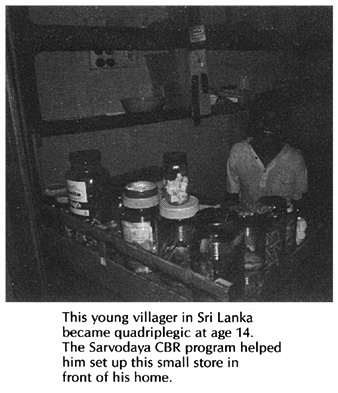 Here is one example from the Sarvodaya community-based rehabilitation program in Beruwala, Sri Lanka. 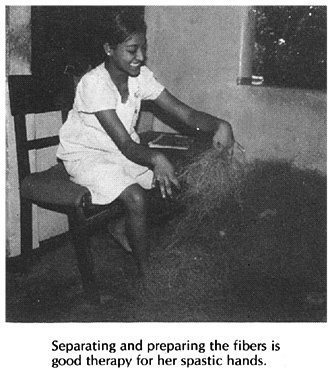 With the help of her family and a village rehabilitation volunteer, this girl with cerebral palsy learned to make rope from coconut fiber (jute). This is a common village craft, so she can work with other villagers.